Meet Daaniyal,writer,verse-maker and Co-founder of Spill Poetry!!! Daaniyal, the poet for whom Poetry is something that helps one to be one’s own self, an expression of freedom, and an art of sharing wisdom. He pens down his thought when the pleasant notes of his mind gets stretched by the unholy incidents all over the World. Daaniyal founded Spill Poetry with his friend Foram Ashish Shah, in December 2016. 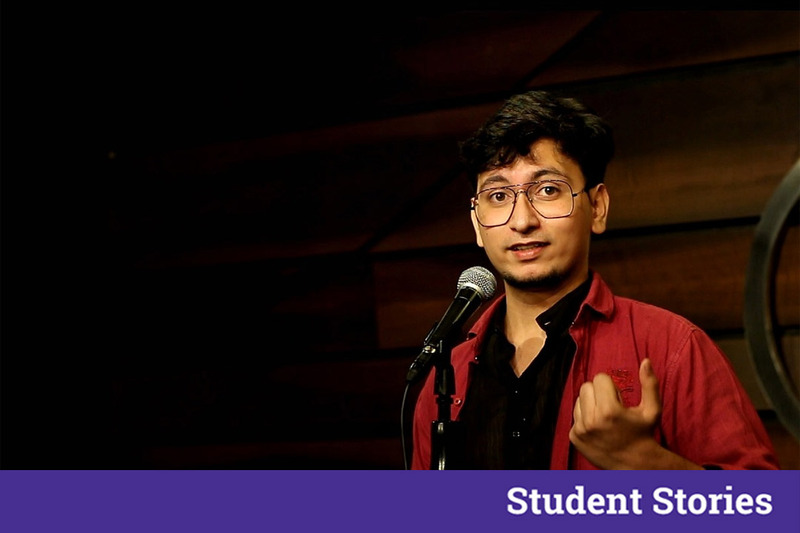 Spill Poetry is a platform that is against the concept of charging any money to artists, willing to express their creativity and this was the fact that ignited the will of founding such a great platform for Artists, in Daaniyal. They entered YouTube 6 months back with the video called “Shayad Wo Pyaar Nahi” by Yahya Bootwala and now the video has crossed over 6.5 million views. Other popular videos include Shukr by Daaniyal, Hawa by Darshan, One less Lonely night by Jidnya Pandya, Sheher by Yahya and many more. Today this YouTube channel has more than 9 million views and 3 lakh subscribers. What is poetry for you? And what according to you is the most important quality that one should have to become a poet? Poetry according to me is anything which let us being us, Poetry is an expression of freedom of one self. Poetry is an art of sharing wisdom, Poetry is everything which makes us, us. To be very honest I don’t consider myself to be a poet or an artist for several reasons, one of which is that I am still learning Poetry. But a quality I believe all poets should and must have in them is that they should be like their Poetry. What are your writings mainly based on? And where from do you get the ideas to start off with the writings? My so called poems mainly revolve around various social issues, issues which disturb the stillness of my soul. I write to keep myself sane and for nothing else. My first poem was about the refugee crisis, the Syrian war made me write, it disturbed me so much that I was in depression, writing about it helped me a lot. What is Spill Poetry about? Tell us something about its history? Spill Poetry is a poetry collective which I along with my friend Foram Ashish Shah, started in December 2016, initially we started off with conducting poetry and music Open mics. Our main aim was and still is not to charge any money to artists who want to share their art with the world (there was this stupid thing back then where platforms were charging poets who wanted to perform at open mics) So we started a platform where no artists would be charged. We entered into the world of YouTube around 6 months ago with this video called ”Shayad wo Pyaar nahi, By Yahya Bootwala”. The habitat music and comedy cafe in Khar Mumbai, owned by my dear friend Balraj Singh Ghai, helped us a lot, He sponsored our videos when we had no money, So Balraj bhai played a very important role in our success, we shoot all our videos at the Habitat and will continue to do so. Since then, the video has crossed around 6.5 million views, Apart from that we produced multiple videos which went viral, Like Hawa by Darshan, Shukr by me, One less Lonely night by Jidnya Pandya, Sheher by Yahya and many more. We now have more than 9 million views and 3 lakh subscribers on our channel. All thanks to the unconditional love and support from the Mumbai poetry circuit and our super talented artists. Can you tell us something about the Spill Poetry Team? The Spill Poetry team consist Have me, Foram Ashish Shah (Co-founder), Johnathan Dsouza ( Our editor and core team member) Azania Patel Deepali Gupta and Ammar Chittwala ( Our photographer). According to you, how is Spill Poetry at variance with other such Poetic platforms? I personally Love, Respect and Support all the other poetry collectives like Kommune, UnErase, I think other platforms are our art Sisters so there is no space for competition, the only thing I believe differentiate Spill from others is that we give our best to make artist heard! And at our open mics we make everyone feel home. Whose writings inspire you the most? I am inspired by each and every person who writes, Because I feel everyone is better than me and that I will always be a learner but some of the poets who have a huge impact on the way I write and think are Ramneek Singh, Gaurav Tripathi, Darshan Rajpurohit, Rakesh Tiwari Aranya Johar, Heema Shavirkar, Anuj Kumbhat, Bappadittya Sarkar and Simar Singh. What message would you like to give to the other young poets or writers out there?